When mold fungus spores reach the air, they can cause a variety of allergy symptoms like a runny nose, itchy eyes, and coughing. 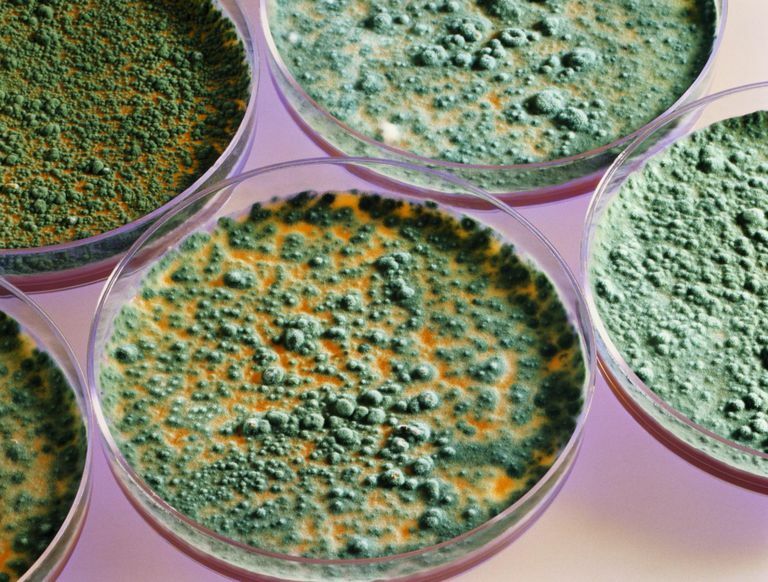 While there are many different types of molds, one common indoor mold is Penicillium, which can cause nasal allergies and asthma in certain people. If you've been diagnosed with a Penicillium mold allergy, you might be wondering if that means you could have a penicillin allergy or food allergies too. Having a Penicillium mold allergy doesn't mean that you're allergic to the antibiotic penicillin. While penicillin was indeed originally developed from Penicillium mold, people with this specific mold allergy are not at any more risk of developing an allergy to this class of antibiotics than anyone else with a history of allergies. Modern-day penicillin antibiotics are produced synthetically and are not contaminated with mold particles. It is possible, however, to have related food allergies if you have a mold allergy. Penicillium can be found in certain aged and blue-veined cheeses, such as Roquefort and Camembert. There have been reports of food allergy reactions in Penicillium-allergic people who eat these cheeses. If you have an allergic reaction to mushrooms, it's more likely that it's from the mushrooms themselves, but symptoms of oral allergy syndrome have been reported in people with mold allergies who have eaten raw mushrooms. Yeast is another potential food allergen if you have a mold allergy. You may be wondering how a mold allergy can be related to a mushroom or yeast allergy. The answer is explained by a phenomenon called cross-reactivity. Cross-reactivity means that there are similar proteins shared between certain foods and certain molds. So if you're allergic to molds, you may very well react to foods like mushrooms that contain a similar protein. There is also ample scientific evidence suggesting cross-reactivity between different pollens and raw fruits and vegetables. Likewise, an allergy to latex can predispose people to certain food allergies (mostly fruits and nuts). Doctors have even named this condition "the latex-food syndrome." The big picture here is that while a mold allergy may lead to a food allergy such as yeast or mushrooms, it doesn't mean you'll develop allergies to medications like penicillin. That being said, a history of allergies puts you at a higher risk of developing other allergies, so it is possible for you to have both an allergy to certain molds and a penicillin allergy, but the two are not interconnected—it's simply a coincidence. Asthma and Allergy Foundation of America. Mold Allergy. Updated October 2015. Gabriel MF, González-Delgado P, Postigo I, et al. From Respiratory Sensitization to Food Allergy: Anaphylactic Reaction After Ingestion of Mushrooms (Agaricus Bisporus). Medical Mycology Case Reports. 2015;8:14-16. doi:10.1016/j.mmcr.2015.02.003. Mayo Clinic Staff. Penicillin Allergy. Updated February 2, 2018. Popescu F-D. Cross-Reactivity Between Aeroallergens and Food Allergens. World Journal of Methodology. 2015;5(2):31-50. doi:10.5662/wjm.v5.i2.31.